Buddy-buddy con men fleece an evil dude. Lightning strikes again as Director, George Roy Hill, reunites with stars, Redford and Newman, from "Butch Cassidy", in a classic period piece. 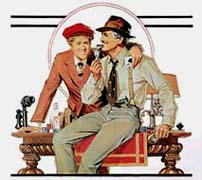 Top drawer cast includes: Paul Newman, Robert Redford, Robert Shaw, Charles Durning, Ray Walston, Eileen Brennan, Harold Gould, and Dana Elcar.